The Old Railway Bike Trail is a leisurely family bicycle trail. 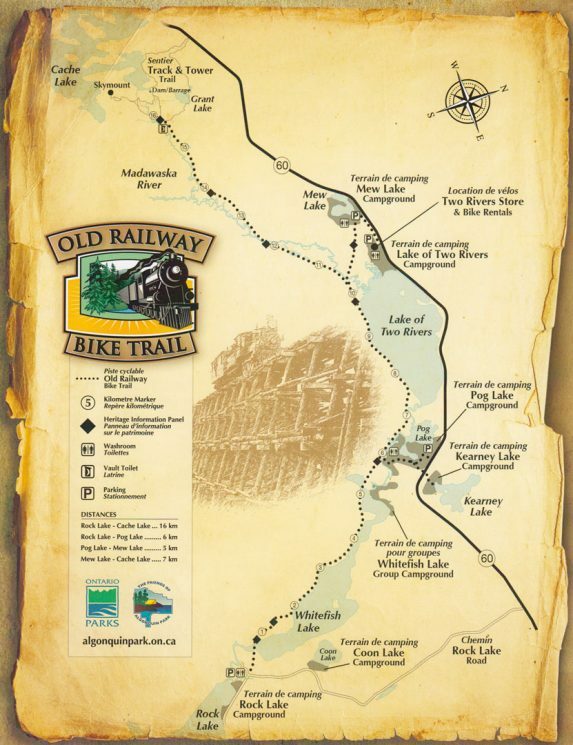 For most of its 32 kilometre distance the trail follows the abandoned bed of the historic Ottawa, Arnprior, and Parry Sound Railway, opened in 1896 and decommissioned in 1959. Easy. This is Algonquin Park’s easiest bike trail suitable for families including children. The surface is level and hard packed having been a section of the now decommissioned Ottawa, Arnprior, and Parry Sound Railway.Several interpretive panels along the route explain Algonquin’s history. The Old Railway Bike Trail is open during snow-free times of the year.